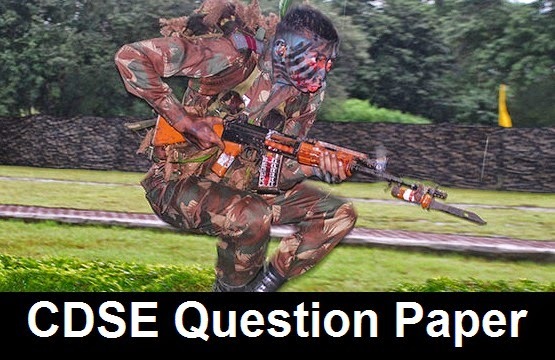 Looking for CDSE previous year question papers? Here we have provided Combined Defence Services Examination II 2012 general knowledge question paper. Check out the CDSE 2012 year question paper here. Notification of CDS exam II 2012 was released by UPSC in June of 2012 and last date of submitting forms was fixed as 02nd July. Combined Defence Services Examination is called as CDSE in short. As the name says, it is the exam conducted for Defence forces recruitment. Basically all selected candidates will become officers in Indian Navy, Army and Air Force. Here we have given previous year CDSE question paper to help aspiring students who want to pass CDS exam easily. By referring the previously asked questions, one can have good idea about the pattern and type of questions asked. Check out CDS exam II 2012 General Knowledge Question Paper Here. Also we recommend all students to check out CDS Exam II 2012 English question paper too.